I know! It's been ages. Nearly a decade, it feels. I hope you don't feel that I abandoned you! Don't worry- all of you right there, in what tiny shred of a heart I have left! For those of you who don't know, or for the rest of you who've drained a box of wine or three since I last posted, I'm a stage manager. And I've been stage managing one of the toughest plays I've ever worked on... The past week of technical rehearsals, dress rehearsals, a preview and an opening night have left me nearly dead. I'm surprised to be alive and breathing! My Vanilla Coke. Pencils. My 'good' pen. Little Post-Its. Post-It tabs. Candy. And: my script, which slowly became filled with light cues, sound cues, projection cues, AND A SNOWSTORM. To make a long story short and protect my reputation: the show opened last night, and I'm still alive. So what am I here, this afternoon, to share? 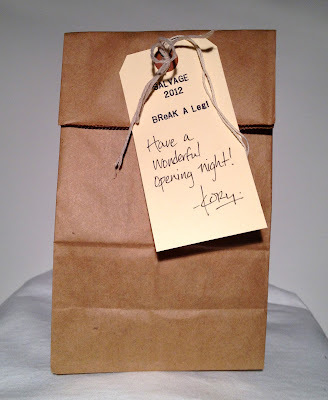 What I made for opening night gifts! I bought lengths of chain at Micheals- it was on sale for 2.50 per package! I already had the rest of the stuff at home- necklace clasps, jump rings- and the most important part, Tim Holtz's Philosophy Tags. I love these things! They are beautiful. For the packaging, I used an office-supply 'Custom Stamp Kit' to make my own stamp- with the title of the play, the year, and that famous theatrical pre-show greeting: "Break A Leg!" I stamped this on two tags. The first, a kraft tag (from Ranger) which I embossed with a Sizzix/Tim Holtz Sewing & Stitching embossing folder. I stamped one of Mr. Holtz's trucks on it, wrapped the necklace around it- and put it in a regular brown paper bag. I folded over the top and punched two holes with my Crop-A-Dile. I took the other stamped tag, just a plain manila shipping tag (bought in bulk at Staples- very cheap! ), wrote a note on it and tied it to the paper bag with some Dollar Tree twine. Isn't that nice looking? I was impressed with myself. For not much money at all, I had a gift for every person involved with the production. It took only about an hour to produce eight of these. Yes, only eight, it's a fairly small (but technically difficult) show. Here's a close-up, cuz I like lookin at it! Well, it's suddenly 4:30. I've got less than two hours before I need to run downtown for tonight's show. I'm so so relieved that the week of technical rehearsal is OVER. There's a reason show people call the week of technical rehearsals "Hell Week." After tomorrow's matinee, I'll have a few nights off and some major relaxing and crafting! And on top of that, I'll be back soon (!) with some exciting news and a new card! I've missed you, too!!! I was excited to sit down and see your card, today! Beautiful!!! Those necklaces are wonderful! Very nice work. Looking forward to having you around more... you have been missed in the cyber world! Your gifts look awesome. That's so nice of you to make gifts for all. What a great gift and especially that they are wrapped around wonderful tags. Great presentation. good to see you blogging. I 2nd, 3rd, 4th or 5th that. I missed you too. I kept checking everyday and was hoping everything was ok but I knew you were busy so understand. Also saw your posts on forum. Really Great Gift. I am sure they loved it. So glad to see you again on your blog. Wonderful necklaces, what a cool memento for the people involved. Fab packaging too. Kory these are cool and the tags too! Lucky friends! Do you ever sleep? Wonderful and thoughtful gifts, Kory! wonderful treats for the cast. Hope the whole run goes well for you all. Enjoying your blog for the first time today. Awesome idea Kory! Who wouldn't love a gift like that! Awesome gifts! Love the packaging you did too. My hubby is an actor (he does recreations of old-time radio shows. There are times when he is so busy with his day job and then his theater company. I love that you take the time to do such nice things for your people.